I am an integrative marine biologist with a research focus on sound as a tool to study marine communities and marine mammal evolution, behavioral ecology, and acoustic communication. 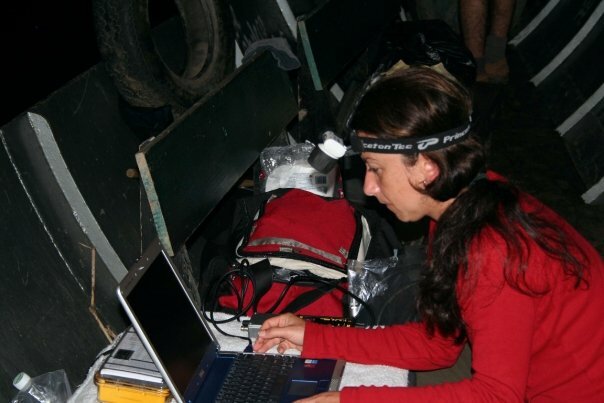 My research involves the use of phylogenies, field observations, autonomous underwater recording systems, and unmanned aerial vehicles to understand the evolutionary and ecological factors shaping marine communities and marine animal communicative signals. My students work on projects including the application of soundscape tools to predict marine biodiversity, humpback whale, dolphin and fish sound emission, impact of underwater noise on marine mammal communication, dolphin population dynamics and social structure. Laura J. May-Collado, Marisol Amador-Caballero, José Julio Casas, Mónica P. Gamboa-Poveda, Frank Garita-Alpízar, Tim Gerrodette, Rocío González-Barrientos, Gabriela Hernández-Mora, Daniel M. Palacios, José D. Palacios-Alfaro, Betzi Pérez, Kristin Rasmussen, Lissette Trejos-Lasso, Javier Rodríguez-Fonseca. 2017. Chapter 12. Ecology and Conservation of Cetaceans of Costa Rica and Panama. In Advances in Marine Vertebrate Research in Latin America (M. Rossi-Santos and C. Finkl eds). Springer Press. Sitar, A., May-Collado, LJ., Wright, A. J., Peters-Burton, E., Rockwood, L., and E.C.M. Parsons. 2016. Boat operators in Bocas del Toro, Panama display low levels of compliance with national whale-watching regulations. Marine Policy. 68: 221-228. May-Collado, L. J., I. Agnarsson, & C. Zambrana. 2016. Global Spatial Analyses of Phylogenetic Conservation Priorities for Aquatic Mammals. In Biodiversity Conservation and Phylogenetic Systematics Preserving our evolutionary heritage in an extinction crisis. Editors: Roseli PELLENS and Philippe GRANDCOLAS. Springer Press. May-Collado, L.J. and S. Quinones-Lebron. 2014. Dolphin changes in whistle structure with watercraft activity depends on their behavioral state. J. Acoust. Soc. Am. EL 135, EL193-198. May-Collado, L.J. 2013. Guyana dolphins (Sotalia guianensis) from Costa Rica emit whistles that vary with surface behaviours. Journal of the the Acoustic Society of America, Express Letters, 134: EL359-EL365. May-Collado, L.J. and J. Forcada. 2012. Small-scale estimation of relative abundance for the coastal spotted dolphins (Stenella attenuata) in Costa Rica: the effect of habitat and seasonality. Revista de Biologia Tropical 60(2): 133-142. Kuntner, M., May-Collado, L. J. and I. Agnarsson. 2011. Phylogeny and conservation priorities of afrotherian mammals (Afrotheria, Mammalia). Zoologica Scripta. 40:1-15. Martinez-Fernandez, D., Montero-Cordero, A. and L. J. May-Collado. 2011. Cetaceos de las aguas costeras del Pacifico norte y sur de Costa Rica. Revista de Biologia Tropical. 59 (1): 283-290. May-Collado, L.J. and D. Wartzok. 2010. Sounds produced by tucuxi dolphins (Sotalia fluviatilis) from the Napo and Aguarico Rivers of Ecuador. Latin American Journal of Aquatic Mammals. Special Issue. LAJAM 8(1-2): 131-136. May-Collado, L. J. 2010. Changes in whistle structure of two dolphin species during interspecific associations. Ethology. 116:1065-1074. May-Collado, L.J. and D. Wartzok. 2009. A characterization of Guyana dolphin (Sotalia guianensis) whistles from Costa Rica: The importance of broadband recording systems. Journal of the Acoustical Society of America. 125 (2): 1202-1213. Agnarsson, I. and L. J. May-Collado. 2008. The phylogeny of Cetartiodactyla: the importance of dense taxon sampling, missing data, and the remarkable promise of Cytochrome b to provide reliable species-level phylogenies. Molecular Evolution and Phylogenetics. 48:964-985. May-Collado, L. J. and D. Wartzok. 2008. A comparison of bottlenose dolphin whistle in the Western Atlantic Ocean: insights on factors promoting whistle variation. Journal of Mammalogy. 89:205-216. May-Collado, L. J., Agnarsson, I., and D. Wartzok. 2007. Phylogenetic review of tonal sound production in whales in relation to sociality. BMC Evolutionary Biology. 7:136 (Highly accessed). May-Collado, L. J., Agnarsson, I., and D. Wartzok. 2007. Reexamining the relationship between body size and tonal signals frequency in whales: a phylogenetic comparative approach. Marine Mammal Science. 23 (3): 524–552. May-Collado, L. J. and D. Wartzok. 2007. Inia geoffrensis high frequency whistles. Journal of the Acoustical Society of America. 121 (2): 1203-1212. Montero, A. & L. J. May-Collado. 2007. Ruido antropogenico: nuevo reto para los cetaceos. Ambientico ISSN 1409-214X Nº 163 ABRIL 2007, pg.10. Agnarsson, I., Coddington, J.A., and L.J. May-Collado. 2007. Elongated pedicillate setae- a putative sensory system and synapomorphy of spiders. Journal of Arachnology. 35: 411-426. Agnarsson, I., Barrantes, G. and L. J. May-Collado. 2007. Notes on the biology of Anelosimus pacificus Levi, 1963 (Theridiidae, Araneae)-evidence for an evolutionary reversal to a less social state. In press. Journal of Natural History. 40:2681-2687. May-Collado, L. J. and I. Agnarsson. 2006. Cytochrome b and Bayesian inference of whale phylogeny. Molecular Phylogenetics and Evolution. 38: 344–354 (2nd most downloaded paper between February and March 2006). May-Collado, L. J. and Morales Ramírez, A. 2005. Presencia y Patrones de comportamiento del delfín manchado costero, Stenella attenuata graffmani (Cetacea: Delphinidae) en el Golfo de Papagayo, Costa Rica. Revista de Biología Tropical. 53:265-276. Rodríguez-Hernández, B. Chinchilla, F. A. and May-Collado, L. J. 2002. Lista de especies,endemismo, y conservación de los mamíferos de Costa Rica. Revista Mexicana de Mastozoología. 6: 19-41. Quiñones‐Lebrón S. G. and L. J. May‐Collado. 2011. Factores determining whistle emission rate in bottlenose dolphins of Bocas del Toro, Panama. J. Acoustic. Soc. Am. 129, 2671. May-Collado, L. J. 2011. Whistle variation is associated with surface behavior in the Guyana dolphin (Sotalia guianensis). J. Acoustic. Soc. Am. 129, 2671. May-Collado, L. J., Aide, M., Alvarez, A., and C. Corrada-Bravo.2010. A comparison of acoustic soundscapes within and among three tropical habitats: Can soundscape heterogeneity be used as an index of α and β diversity? J. Acoustic. Soc. Am. 128, 2412. May-Collado, L. J. and D. Wartzok. The effect of dolphin watching boat noise levels on the whistle acoustic structure of dolphins in Bocas del Toro, Panama. International Whaling Commission 2015. SC/66a/WW5. May-Collado, L. J. The acoustic behavior of Bocas del Toro dolphins varies with watercraft activity International Whaling Commission 2015. SC/66a/WW6. Trejos Lasso, L. and May-Collado, L. J. Bottlenose dolphins tursiops truncatus strandings in Bocas del Toro caused by boat strikes and fishing entanglement. International Whaling Commission 2015. SC/66a/WW7. May-Collado, L. J., Quiñones-Lebrón, S. G., Barragán-Barrera, D. C., Jose D. Palacios, Monica Gamboa-Poveda, and A. Kassamali-Fox. The Bocas del Toro dolphin watching industry relies on a small community of bottlenose dolphins: implications for management. International Whaling Commission 2015. SC/66a/WW10. Kassamali-Fox. A., Christiansen, F., Quinones-Lebron, S., Rusk, A., May-Collado, LJ, and B. Kaplin. Using Markov chains to model the impacts of the dolphin watching industry on the dolphin community of Dolphin Bay, Bocas del Toro, Panama. International Whaling Commission 2015. SC/66a/WW11. Sitar, A., May-Collado, LJ, Wright, AJ, Peter-Burton, E, Rockwood, L, and ECM Parsons. The effect of whale watching vessels on the behaviour of common bottlenose dolphins (tursiops truncatus) in Bocas del Toro, Panama. International Whaling Commission 2015. SC/66a/WW12. Sitar, A., May-Collado, LJ, Wright, AJ, Peter-Burton, E, Rockwood, L, and ECM Parsons. Low levels of compliance with national whale watching regulations in dolphin watching boat operators in Bocas del toro, Panama. International Whaling Commission 2015. SC/66a/WW14. Sitar, A., May-Collado, LJ, Wright, AJ, Peter-Burton, E, Rockwood, L, and ECM Parsons. Tourists perspectives on dolphin watching in Bocas del Toro, Panama support sustainable and educational tourism. International Whaling Commission 2015. SC/66a/WW15_. Sitar, A., May-Collado, LJ, Wright, AJ, Peter-Burton, E, Rockwood, L, and ECM Parsons. Opinions and perspectives of the dolphin watching boat operators in Bocas del Toro, Panama. International Whaling Commission 2015. SC/66a/WW16. May-Collado, L. J., Quiñones-Lebrón, S. G., Barragán-Barrera, D. C., Jose D. Palacios, Monica Gamboa-Poveda. 2014. The dolphin watching industry of Bocas del Toro continues impacting the resident bottlenose dolphin population. International Whaling Commission, Slovenia. SC/65b/WW06. Sitar, A., May-Collado, L. J., Parsons E. C. M. 2014. High levels of non-compliance with whale-watching regulations in Bocas del Toro, Panama and effects of non-compliance on bottlenose dolphin behavior. International Whaling Commission, Slovenia. SC/65b/WW09. May-Collado, L. J.1,2, Barragán-Barrera, D. C.3, Quiñones-Lebrón, S. G.1, & W. Aquino-Reynoso1. 2012. Dolphin watching boats impact on habitat use and communication of bottlenose dolphins in Bocas delToro, Panama during 2004, 2006-2010. International Whaling Commission. SC/64/WW2. Barragán-Barrera DC, May-Collado LJ, Quiñones-Lebrón SG, Caballero S. Population at risk: low genetic diversity in bottlenose dolphins of Bocas del Toro, Panama. International Whaling Commission 2013; SC/65a/SM15: 1–11. Gamboa-Poveda M. and L. J. May-Collado. 2006 Insights on the occurrence, residency, and behavior of two coastal dolphins from Gandoca-Manzanillo, Costa Rica: Sotalia guianensis and Tursiops truncatus (Family Delphinidae). International Whaling Commission. SC/58/SM4. May-Collado, LJ, On the evolution of acoustic communication of Cetaceans and their terrestrial relatives.Biennial Conference on the Biology of Marine Mammals, San Francisco Dec 12-18, 2015. Oral Presentation. Kassamali-Fox. A., Christiansen, F., Quinones-Lebron, S., Rusk, A., May-Collado, LJ, and B. Kaplin. 2015. Evaluating the effects of dolphin watching boats on the behavior of bottlenose dolphins in Bocas del Toro, Panama: using Markov chains to model the impacts of tourism on a genetically distinct population. Biennial Conference on the Biology of Marine Mammals, San Francisco Dec 12-18, 2015. Oral Presentation. Barragan-Barrera et al. High population structure of bottlenose dolphin population in Bocas del Toro, Panama.Biennial Conference on the Biology of Marine Mammals, San Francisco Dec 12-18, 2015. Poster Presentation. Monica Gamboa-Poveda, Giselle Veve, Dalia-Barragan-Barrera, Ayshah Kassamali-Foxand Laura J. May-Collado.Residency and association patterns of two neighboring populations of bottlenose dolphin in the Caribbean coast of Costa Rica and Panama.Biennial Conference on the Biology of Marine Mammals, San Francisco Dec 12-18, 2015. Poster Presentation. May-Collado LJ and D. Wartzok. 2015. The effect of changing ambient noise levels on the whistle acoustic structure of dolphins in Bocas del Toro, Panama. Watkins Memorial Meeting at Bedfort, MA. May-Collado, L. J., Quiñones-Lebrón, S. G., Barragán-Barrera, D. C. Jose D. Palacios, Monica Gamboa-Poveda. La observación comercial de delfines afecta el uso de hábitat de los delfines nariz de botella de Bocas del Toro: pasado, presente, y un futuro preocupante. SOLAMAC, Cartagena, Dec. 1-5, 2014. Oral Presentation part of the Whale-Watching Symposium. May-Collado LJ and SG Quiñones-Lebrón. 2013. Estado del conocimiento de los delfines de Bocas del Toro y su interaccion con la observacion comercial de avistamientos de delfines en Panama. Grupo Argentina/International Whale Commission. Diciembre, Cartagena, Colombia. Barragán-Barrera DC, May-Collado LJ, Quiñones-Lebrón SG, Caballero S. Population at risk: low genetic diversity in bottlenose dolphins of Bocas del Toro, Panama. 20 th Biennial Conference on the Biology of Marine Mammals, New Zealand. Poster Presentation. Mesnick, S. L., May-Collado, L J, Agnarsson, I., Ralls, K., Chan, C., and A. Allen. 2012. Sexual selection sperm competition and the evolution of cetacean mating systems. 49th Annual Meeting of the Animal Behavior Society - June 10-14 2012 (Joint HBES). New Mexico. May-Collado, L. J. and I. Agnarsson. 2009. Phylogenetic analyses of conservation priorities for cetaceans and pinnipeds. 18th Biennial Conference on the Biology of Marine Mammals, Quebec. Oral Presentation. Gamboa-Poveda, M. P., Ramirez, O., and L.J. May-Collado. 2009. Population size, distribution, and habitat use of two sympatric dolphin species the Guyana dolphin (Sotalia guianensis) and the Bottlenose dolphin (Tursiops truncatus) from the Southern Caribbean of Costa Rica. 18th Biennial Conference on the Biology of Marine Mammals, Quebec. Poster. Barragan-Barrera, D. C., Palacios Alfaro, J. D., Taubitz, E., and L. J. May-Collado. 2009. A spatial analysis of habitat use by bottlenose dolphins from Bocas del Toro, Panama. 18th Biennial Conference on the Biology of Marine Mammals, Quebec. Poster. Garcia, C., Avila, I. C., Palacios, D., Gerrodette, T., Suarez, M. Soler, G., Trujillo, F., Bessudo, S., Rasmussen, K., May-Collado, L. J., and C. Parson. 2008. Presencia, distribución y amenazas de Stenella attenuata y Tursiops truncatus en el Pacífico de Panamá y Colombia. Mamiferos Acuaticos de Sur America, Uruguay. Poster. Paulo A.C. Flores, Mariel Bazzalo, Susana Caballero, Marcos C.O. Santos, Marcos R. Rossi-Santos, Fernando Trujillo, Jaime Bolaños-Jimenez, Marta J. Cremer, Laura J. May-Collado, Flávio J. L. Silva, Maria Gabriela Montiel, Alexandre F. Azevedo, Ana C. O. Meirelles, Leonardo Flach, Hector Barrios, Paulo C. Simões-Lopes, Haydée A. Cunha and Koen Van Waerebeek. 2008. Proposed English common name of Sotalia guianensis dolphin. Mamiferos Acuaticos de Sur America, Uruguay. Poster. May-Collado, L. and D. Wartzok. 2007. The intertwined evolutionary history of tonal sounds and social complexity: a phylogenetic approach. 17th Biennial Conference on the Biology of Marine Mammals, Nov 29-Dec3, Cape Town, South Africa. Poster. Martínez-Fernández, D., A. Montero-Cordero and L. J. May-Collado. 2007. Evaluation of photo-ID techniques success in Pseudorca crassidens from coastal waters of Costa Rica. 17th Biennial Conference on the Biology of Marine Mammals, Nov. 29th- Dec. 3rd. Cape Town, South Africa. Poster. May-Collado, L. and M. Gamboa-Poveda. 2006. Insights on the biology of Sotalia guianensis at Gandoca-Manzanillo, Costa Rica: residency, habitat use, acoustics, and reactions to anthropogenic noise. Sotalia Workshop, Rio de Janeiro, Brazil. Abstract. May-Collado, L. and D. Wartzok. 2005. The evolution of cetacean whistles: a phylogenetic comparative approach. 16th Biennial Conference on the Biology of Marine Mammals, Dec 12-16. San Diego, USA. Oral Presentation. Martinez-Fernandez, J. D., Cordero-Montero, A., L. May-Collado, and J. Calambokidis. 2005. Photo-ID of false killer whales of Costa Rica. 16th Biennial Conference on the Biology of Marine Mammals, Dec 12-16. San Diego, USA. Poster. May-Collado, L. Wartzok, D., and M. Gamboa. 2005. Plasticidad en las vocalizaciones de delfines? : efecto del ruido antropogenico en Costa Rica. Primer Congreso de Vida Silvestre Latinoamericano, San Jose Costa Rica, Feb 2005. Poster. Cordero-Montero, A. and L. J. May-Collado. 2005. Evaluación de la técnica de foto-identificación en el delfín manchado costero, Stenella attenuata graffmani. Primer Congreso de Vida Silvestre Latinoamericano, San Jose Costa Rica, Feb 2005. Poster. Rasmussen, K.; Calambokidis, J.; Steiger, G.; Saborio, M.; May-Collado, L. and T. Gerrodette. 2001. Extent of geographic overlap of north Pacific and south Pacific humpback whales on their Central American wintering grounds. 14th Biennial Conference on the Biology of Marine Mammals, Nov 28- Dec 3. Vancouver, Canada. Talk. May-Collado, L. and J. Forcada. 2001. Abundance, Occurrence and Behavior of the coastal spotted dolphin (Stenella attenuata graffmani) in the northern Pacific of Costa Rica. 14th Biennial Conference on the Biology of Marine Mammals, Nov 28-Dec 3. Vancouver, Canada. Poster. May-Collado et al. 2015. The Archipelago of Bocas del Toro: Urgent need for marine conservation planning and development of sustainable eco-tourism practices. Report to Waitt Foundation, March. 2015. May-Collado LJ. Decimo aniversario del proyecto sobre la biologia y estatus de conservacion de los delfines del Archipelagoo of Bocas del Toro, Panama. Reporte Tecnico, Julio 2014. May-Collado et al. 2013. Conservation Status of the dolphins of Bocas del Toro: 2004-2012. Reporte Tecnico, Julio 2013. Ambientes Marino Costeros de Costa Rica. V. Nielsen Munoz y M. A. Quesada Alpizar (edis). Capitulo X. Mamiferos Marinos. Laura May-Collado. ESTATUS POBLACIONAL DE LOS DELFINES NARIZ DE BOTELLA (Tursiops truncatus) DE BOCAS DEL TORO, PANAMÁ: RESULTADOS PRELIMINARES DE UN ESTUDIO DE TRES AÑOS. 2007. Elaborado por: Laura J. May-Collado; Ingi Agnarsson; Jose David Palacios; Evi Taubitz y Douglas Wartzok. Reporte Tecnico. ​Affiliated Professor at Universidad Maritima Internacional de Panama. My research interests span topics on evolution, animal communication, soundscapes, marine conservation and behavior of marine vertebrates. B. Sc., Biology. University of Costa Rica. San Jose, Costa Rica. M.Sc., Biology. University of Costa Rica. San Jose, Costa Rica. Ph.D., Biology. Florida International University. 2003-2007.